I am honored to have a few pieces in the Portrait Invitational show that's currently at Blue Gallery here in Kansas City. I had so much fun creating the recent piece I did for the Kansas City Art Institute auction, that I decided to try something similar with this piece. It's fun trying to figure out what's going to go where and how the pieces are going to fit together, especially considering that I have no idea what the final outcome will be. 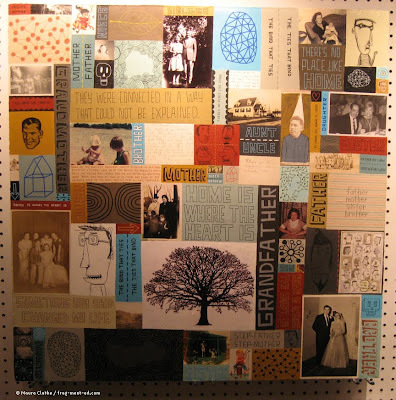 Unlike the piece for KCAI, this piece has several family photos in it. While not all of the photos are personal, a handful of them are pictures of relatives mostly from my mom's side of the family. When I use personal photos, I never use the originals. I always have new prints made. The other photos in the piece, however, are actual prints that I've found in various antique malls and shops over the years. It's interesting what you find out there. For me, these little fragments of peoples' lives captured on pieces of paper create new stories as I try to figure out in what context they were taken when they were taken and what they mean to me, now, so many years later. For some detailed pics, please check out my flickr page. Needless to say, I have several favorites from the show, a few of which I had to post. 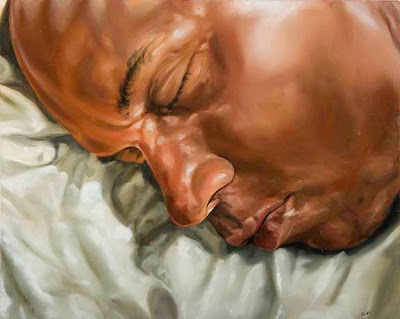 This first piece is by Eric Zener. I love it. Wow. It just blows me away. The subtlety of light captured within this piece is beautiful to me. It feels like the early morning, eyes slightly pained with the knowledge of having to wake up. I am not a morning person. I can relate. This beautifully executed piece, by Brad Williams, is another favorite of mine. I love the calm tension in this piece. It feels and looks like water is rising, yet the calmness on her face makes you wonder if that's what's happening or not. I also love the lack of color in this piece. The color in her face and eyes as well as her jet-black hair and sweater really makes you focus on her, and not the rising water. 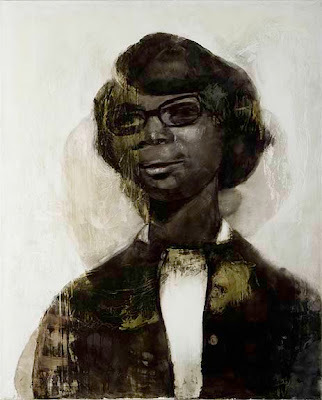 The last piece I'll share from the show, and perhaps my favorite of them all, is this wonderful piece by Sola Sawyerr. These ghostlike images capture the feeling of so many of the old photographs I find. Worn and weathered, held and treasured, they once meant something very dear to the person who carried the image of their loved one with them. They are both beautiful and sad to me. I love the mark-making in this piece. The textures seem to indicate the time that's passed. These pieces illustrate part of why I am so honored to be a part of this show: I cannot paint like this. I think in my life I have done one actual portrait in oil on canvas. It was a painting of my brother when he was about 10 years old. (His wife now owns the piece.) I am not saying I would necessarily want to paint this way. I'm happy and thankful every day to be able to do what I do, the way I do it. But, I have always been - and continue to be - blown away by artists who can draw or paint someone and capture their likeness so exquisitely. 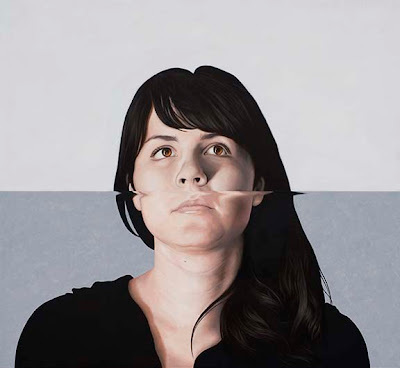 The Portrait Invitational Exhibition at Blue Gallery is open now and runs through October 2009. Gallery hours are Tuesday - Saturday 10 am - 5:30 pm, or by appointment. Photos taken from Blue Gallery's website.